Uganda: Can't Tell Me Nothing - Kanye West On the Wrong Beat, Who'll Tell Him? Kanye West continues to surprise the world. After meeting with President Donald Trump, Kanye came to Uganda and met with President Yoweri Museveni. During this visit, he said the spirit of Fela Kuti flows in him. Is Kanye on the wrong beat? A Kiswahili proverb goes thus: mwenye macho haambiwi tazama. Which translates to, one who has eyes isn't told to look. However, this proverb might not be applicable to Kanye Omari West. The American rapper who is currently in Uganda, met with President Yoweri Kaguta Museveni. A week prior to his visit to Uganda, Kanye had met with U.S. President Donald Trump. His meeting with President Trump came under serious criticism, as has his declaration that "slavery is a choice." 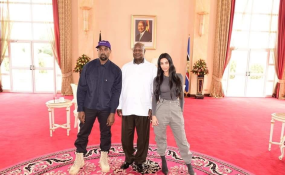 On the continent, Kanye's visit to Uganda has raised a new set of questions including Kanye's continual idolisation of dictators, his far flung political consciousness, and basically what he stands for. In a country where a fellow musician, Bobi Wine, who's currently a Member of Parliament, had been tortured, beaten and his life threatened, by the Museveni regime, Kanye had no issues buddying up with President Museveni. While Kanye is losing on the American front, he's also losing hugely on the African front. While in Uganda, in one of his rants he said, "I am the best living record artist. We, rather, because the spirits flow through me. The spirit of Fela, the spirit of Marley, the spirit of Pac flows through me." Unfortunately, Kanye is bereft of history. If Kanye's Oval office was "insulting to the public" his comparison to Fela Anikulapo Kuti is insulting and disrespectful to the continent. The one thing, any Nigerian and lover of Fela will assure you of, is that Fela would never tell someone like Donald Trump "I love this guy," and neither would Fela meet with someone like President Museveni. The very political and social issues Fela opposed, a corrupt government, ineptitude, are the very same things Kanye endorses. While Kanye might have eyes, he clearly doesn't see anything wrong in what he's doing, but can anyone tell him anything or as his once sang, "you can't tell me nothing, right?"